What processes have a high impact on your business strategy? "What processes have a high impact on your business strategy?" Value‐driven Business Process Management Discipline directs the traditional process improvement approaches like Lean or Six Sigma to the right targets where they deliver best value and address issues through other approaches with an appropriate automation. But the traditional process improvement approaches often don't lead to any tangible business outcomes while consuming significant resources. What are the additional capabilities and processes that a company with traditional improvement approaches would require to build a value-driven Business Process Management discipline? What processes are less critical for achieving organization's strategic objectives? What is the sole purpose of your business process improvement strategies? 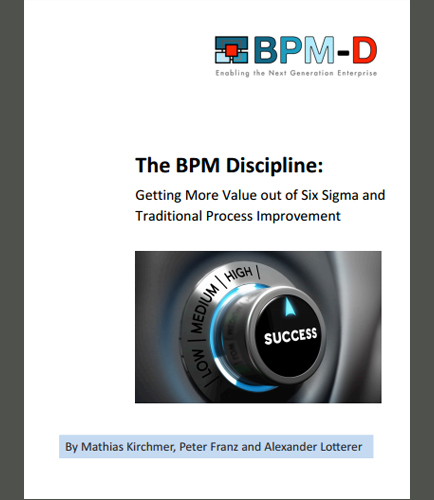 This whitepaper looks at how organizations can use the Business Process Management Discipline to overcome many of the shortcomings of traditional process improvement approaches and point them at the right targets where they deliver best value.